Based upon the success of its television series BLAZE & THE MONSTER MACHINES which had ratings that placed it as best preschool show on television and number one for its time slot in the first quarter of 2015, Nickelodeon is launching a month of monster truck mayhem in May. 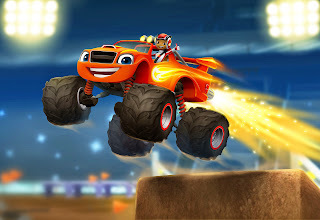 Blaze and the Monster Machines features the amazing monster truck Blaze and his eight year old driver AJ having adventures that explore the physics of how things move; tackle problems through scientific inquiry and mathematics; and discover the parts needed to make everyday technologies work. The series which airs weekdays at 1:30 pm (ET/PT) on Nickelodeon is filled with monster trucks, humorous situations, and upbeat original songs with lyrics that highlight a designated STEM (science, technology, engineering, math) topic for each show such as friction, trajectory, and magnetism. Nickelodeon will be launching a brand new toy line, a special new episode titled "Dragon Island Duel", a companion game to Dragon Island Duel on the Nick Jr.website, and an update to the Blaze app. 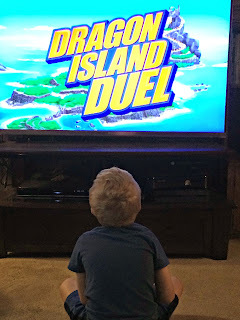 Nickelodeon provided us an advance opportunity to watch "Dragon Island Duel" which my son really enjoyed. As soon as the episode concluded my son jumped up and asked if he could watch it again. When asked what his favorite part of the show is, he remarked he likes the songs which was reinforced by his humming one of them throughout the rest of the day. While the show is aimed for 3 to 5 year olds, my 6 year old kindergartener had fun watching it and many of the educational points of the show were relevant to things he is learning about now in school. He really got into interacting with the show yelling out answers to answers and problems involving STEM concepts that were addressed in its story. The show will probably be too elementary for most kids though as they reach first grade and on, but the show is rated and marketed for a preschool audience and I believe most kids in that age range will appreciate and learn some nifty lessons from it. 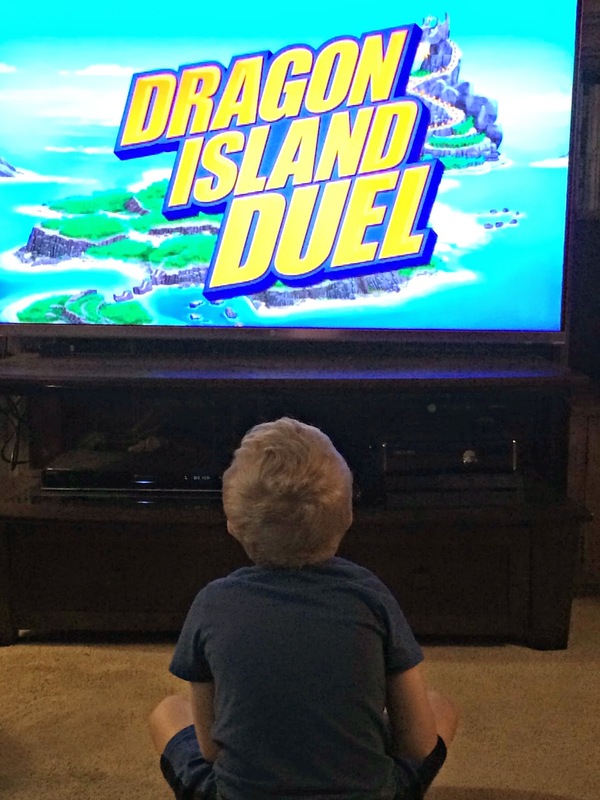 "Dragon Island Duel" will premiere at 11 am (ET/PT) on May 25, 2015. The episode features Blaze and his nemesis Crusher going up against one another in a one-on-one race to the top of Mount Dragon. Although it is one of the toughest races their team has ever faced, best friends Blaze and AJ know they have what it takes to beat Crusher. Despite Crusher's attempt to cheat and trap Blaze in a cave far off the course before the race begins, AJ manages to free his monster truck while overcoming larger-than-life obstacles along the way. Crusher tries to cheat one last time along the route, but Blaze and AJ prove no one can beat best friends by winning the race in a thrilling finale. Throughout the half-hour special, children will be introduced to the STEM concept of investigation. Tied to this new episode, beginning May 8, kids can play a free "Dragons Island Race" game on the Nick Jr. web site. Players must help Blaze get past all of the obstacles in his path as he races Crusher to the top of Mount Dragon. The web site will also provide an exclusive five minute first look at the "Dragon Island Duel" episode from May 18 - 25. Also as of May 8th, the Blaze and the Monster Machines app will offer users the ability to help Blaze and AJ compete on all-new jungle tracks when with parental approval kids purchase the Dragon Island location. The new features allow kids to race against Stripes and has them contend with new obstacles like coconut and banana launchers on Crusher when they race against him. The app, like the television show, introduces its users to STEM concepts as they race along preset courses or build their own race tracks. 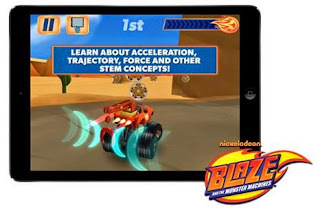 Additionally, Nickelodeon and Fisher-Price, a subsidiary of Mattel Inc., is launching an all-new toy line based on Blaze and the Monster Machines at select retailers starting in May with a full nationwide rollout in August. The toys will include a die cast collection of the monster trucks, talking and transforming vehicles, playsets, and plush of the show's characters. 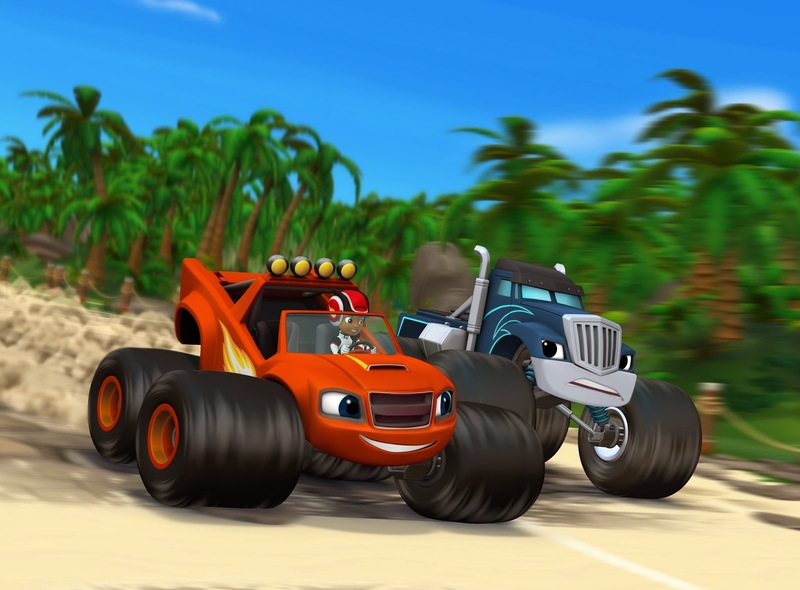 Blaze and the Monster Machines gets A Geek Daddy nod of approval for being entertaining and educational for girls and boys alike encouraging them to explore the science and technology behind vehicles and race car driving. I'm glad this is an educational and entertaining show! I love when kids learn through something that is enjoyable. Your son is one lucky kid! Looks really cool. My daughter would love this! That looks like a fun advance showing... one my 5 year old would love too. Oh Nickelodeon—brings back memories from when I was a kid. I know plenty of little boys who would love this. Sounds like a cool show that my boys would love. We'll have to check this out, thanks for sharing!